African-Americans have been sharply divided along age lines during the Democratic primary, with black voters under 30 narrowly favoring Sen. Bernie Sanders over Hillary Clinton, while older blacks overwhelmingly backed the former secretary of state. Clinton has won more than 70 percent of the African-American vote in most of the states with a sizable black population that have held primaries or caucuses. Her advantage among African-Americans has been one of the most important factors in her delegate lead over Sanders. But an analysis of 25 states that held primaries and where exit polls were conducted by NBC News showed that one of Sanders’ challenges is that younger blacks are not voting in large numbers. Sanders, according to the exit polls in these states, received 52 percent of the votes of African-Americans under 30, compared to 47 percent for Clinton. Among blacks ages 45-59, Clinton was ahead 85 percent to 14 percent. 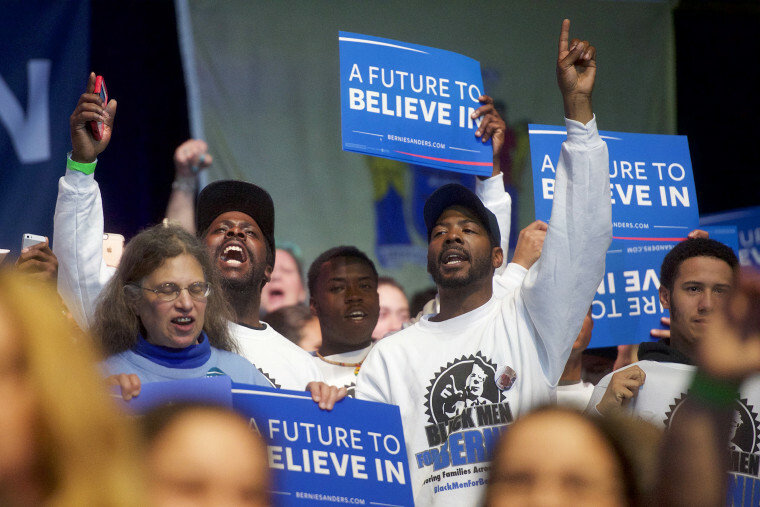 Among blacks ages 30-44, Clinton won 70 percent, Sanders 29 percent. Hillary Clinton has won more than 70 percent of the African-American vote in most of the states with a sizable black population, but that varies greatly by age. The turnout gap was stark. About 9 percent of the black voters in these states were under 45, compared to 16 percent over 45. The data in some ways contradicts two of the primary narratives about the campaign: Sanders’ weak performances among African-Americans may have been because of their age, which made them more likely to back Clinton, like other older voters, not their race; and Clinton, who has lost the under 30 vote in state-after-state to Sanders, may be particularly unpopular among white millennials, as opposed to that entire generation. This age gap, in terms of turnout, is not surprising. Older people of all races traditionally vote more than younger ones. In the 2012 general election, according to U.S Census data, about 57 percent of U.S. citizens between ages 25 and 44 voted, compared to 68 percent of those between 45 and 64. Among African-Americans, there was a gap as well, although it was smaller: 65 percent of blacks between ages 25 and 44 voted, compared to 72 percent between 45 and 64. Stephanie Pysyllos contributed to this story.